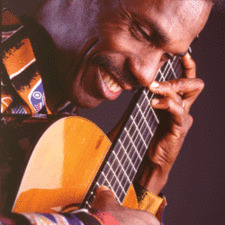 There are few performers in the world today as versatile and fascinating as guitarist/singer/percussionist Celso Machado. Brazilian-born and Vancouver-based, Machado delights his audiences with his subtle mixture of musical inspiration, irresistible rhythm, and inspired lunacy. He is a highly respected multi-instrumentalist and composer, and Marcus Vinícius, one of Brazil’s leading critics, has hailed him as “ the most important Brazilian guitarist of the new generation.” Whether he’s leading the audience in a call-and-response percussion number or performing a spry bossa nova rendition of the Xavier Cugat favourite Brazil, Machado’s performances are unerringly thrilling, beautiful, and awe-inspiring.